The UTM grid is designed primarily for local land navigation. Global travelers--e.g. aviators and mariners--will find it less than useful for their purposes. But for land navigation--usually limited to a relatively small area--the UTM grid is just the thing because it divides the territory into neat little squares, making pinpointing your position a snap. 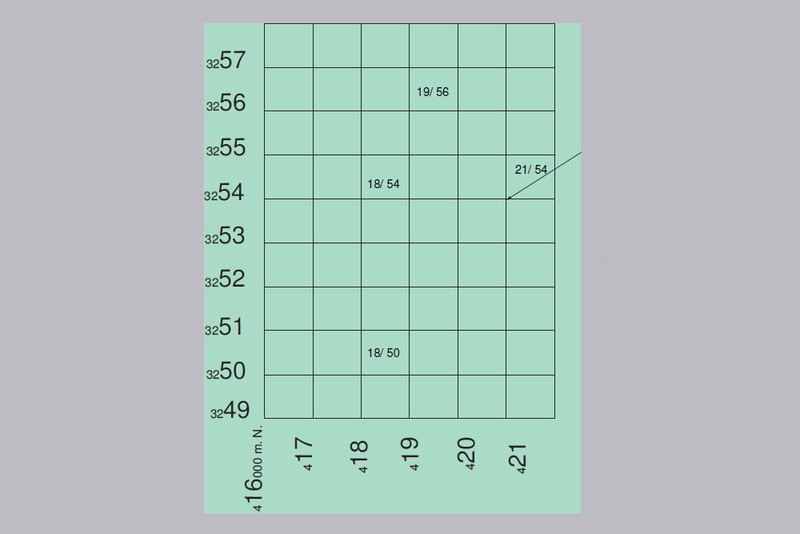 The lat/long grid, on the other hand, is more cumbersome because those pesky, converging longitude lines make plotting your position more cumbersome. The UTM grid starts by dividing the earth into sixty zones, each six degrees of longitude wide. Each zone runs from the north pole to the south pole. Pictured below is the earth, with longitude lines drawn in a selected section. Highlighted in green is one single UTM zone. The sixty zones are ingeniously numbered...from 1 to 60. 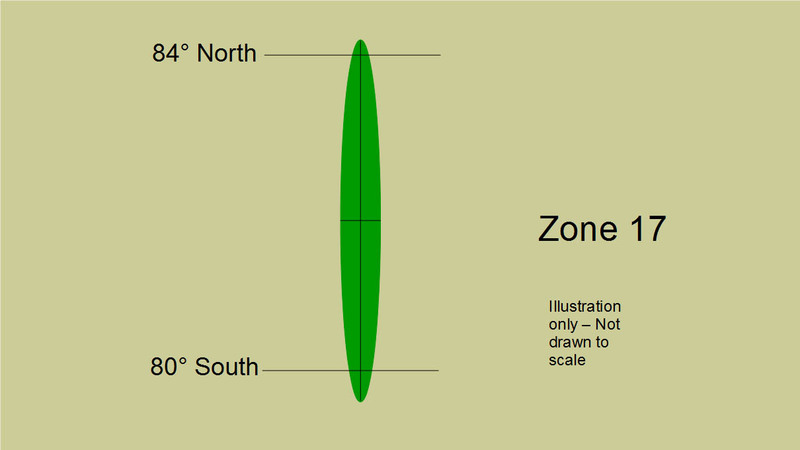 Zone 1 starts at the 180-degree west longitude line, and zone 60 ends at the 180-degree east longitude line. The illustration below shows all 60 zones as they would look if the earth were flattened out to fit on a sheet of paper. 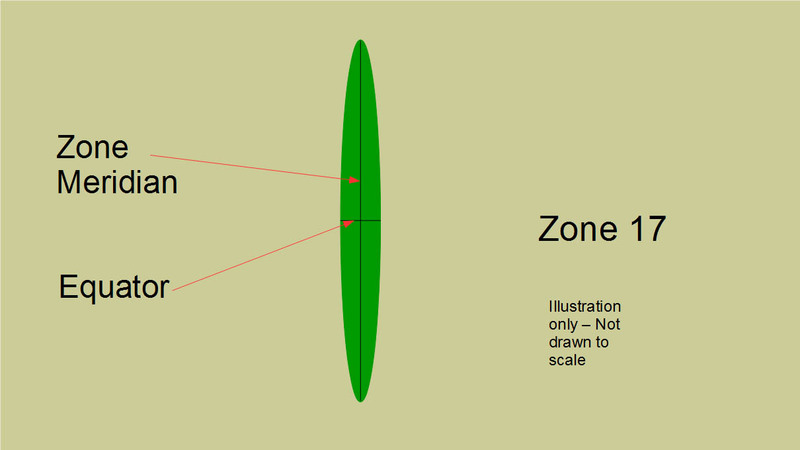 Since the zones are bounded by converging longitude lines, each zone's boundary converges at each end of the zone. Each zone is divided north to south by a center line called the "zone meridian." Also, each zone is divided east to west by the equator. 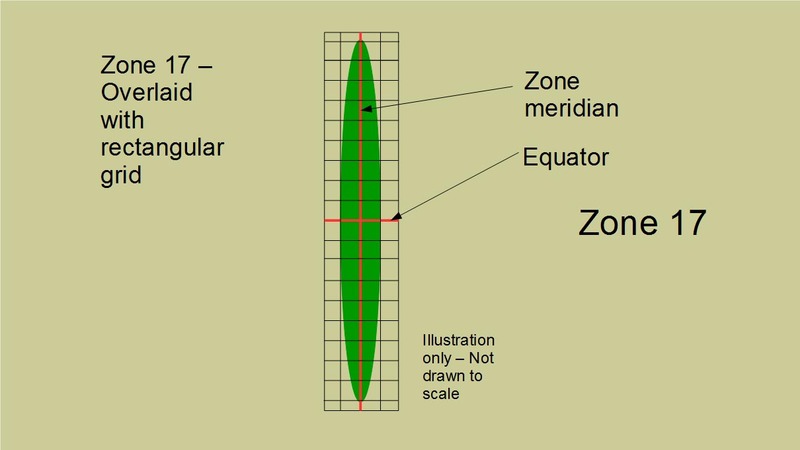 The illustration below shows a selected zone--zone 17, in this case--with its zone meridian and the equator depicted. This grid is 1,000,000 meters wide. 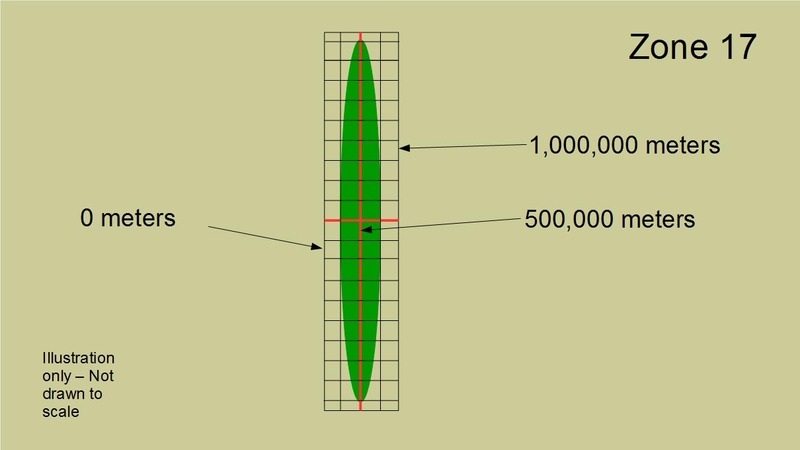 The grid's width is assigned values from 0 meters at zone's eastern boundary to 1,000,000 meters at the zone's western boundary. The zone meridian, which divides the zone down the center, therefore has a value of 500,000 meters. The grid is 20,000,000 meters long. In the Southern Hemisphere, the grid's values go from 0 meters at the South Pole to 10,000,000 meters at the equator. In the Northern Hemisphere, the grid's values are "reset," you might say, and start again from 0 meters at the equator to 10,000,000 meters at the North Pole. Even though we've talked about the grid running from pole to pole, the UTM grid is not used below 80 degrees south latitude, or above 84 degrees north latitude. Beyond those latitudes, distortion would be too great. Therefore, a completely different grid is used in those areas. It's called the Universal Polar Stereographic (UPS) grid. North-south grid lines are called "eastings" because they measure how far east you are in the zone. The farther east you go in the zone, the greater are these easting values. The zone meridian has a value of "500,000 meters east." Any value less than 500,000 meters is west of the zone meridian. And any value greater than 500,000 meters is east of the zone meridian. East-west grid lines are called "northings" because they measure how far north you are in the zone. The farther north you go in the zone, the greater are these northing values. You'll recall that northing values are reset to 0 at the equator. The UTM system is designed so that there is never any need for negative numbers. All grid values are positive, no matter which hemisphere you're in. Notice that much of the grid falls outside the zone's actual geographical boundaries. Therefore, grid values in areas falling outside the zone are not valid for navigation purposes. 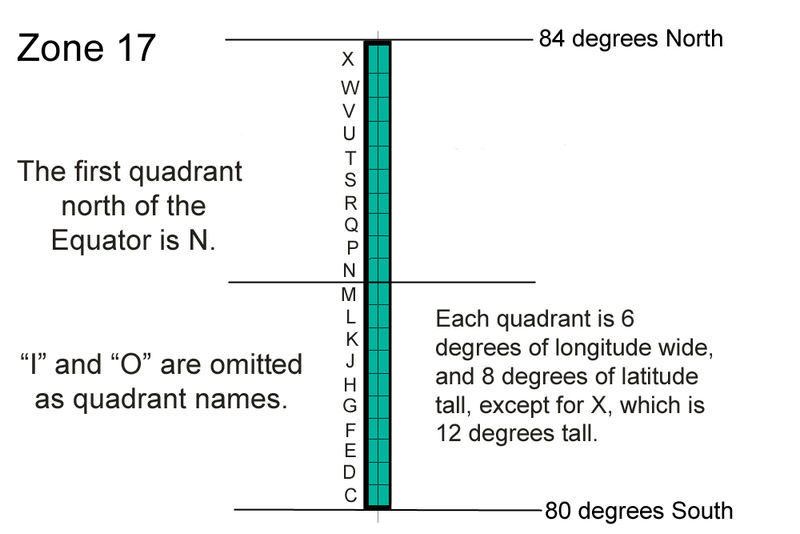 Moreover, grid values below 80 degrees south latitude, and above 84 degrees north latitude are not valid. 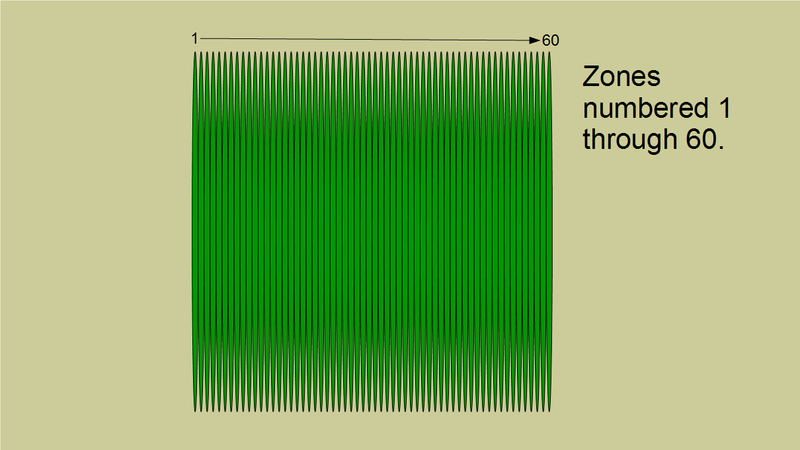 The minimum valid easting for any zone is 166,640, and the maximum valid easting is 833,360. In the southern hemisphere, the minimum valid northing is 1,110,400. And in the northern hemisphere, the maximum valid northing is 9,334,080. 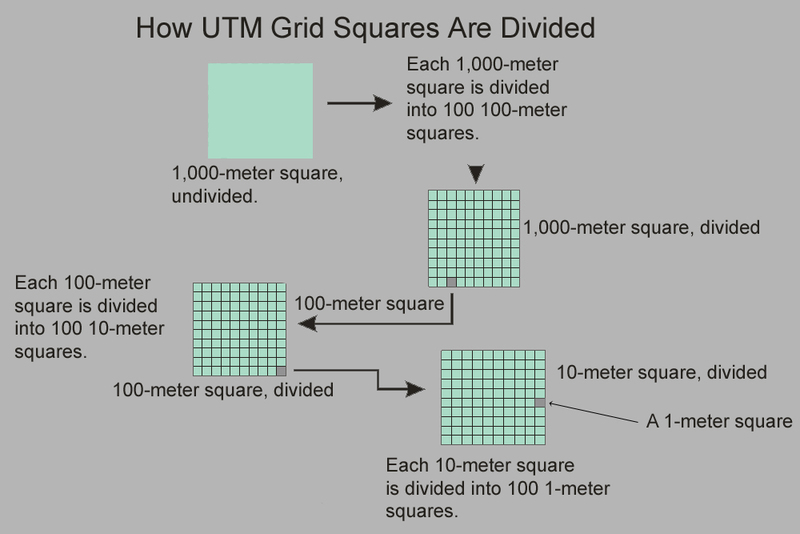 Each UTM zone is divided horizontally by quadrants. Quadrants are labeled C, starting at 80 degrees South, and run all the way through X, ending at 84 degrees North. I and O are omitted since they could be confused with a 1 and a 0. Each quadrant is 8 degrees tall, except for quadrant X, which is 12 degrees tall. It just so happens that the first quadrant north of the equator is N. That happy coincidence is a good way to help you remember which hemisphere you're dealing with. If the quadrant is N or subsequent to it, you're in the northern hemisphere. Anything before N describes the southern hemisphere. 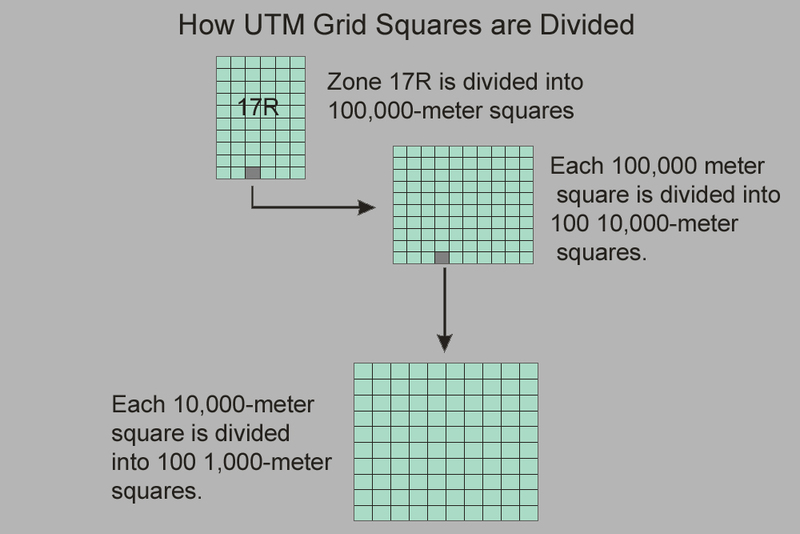 To continue illustrating UTM zones, we'll zoom into zone 17, quadrant R. Quadrant R, like all quadrants, is divided into 100,000-meter squares (i.e. an area 100,000 meters x 100,000 meters). Each 100,000-meter square is divided into 100 10,000-meter squares. Each 10,000-meter square is divided into 100 1,000-meter squares. 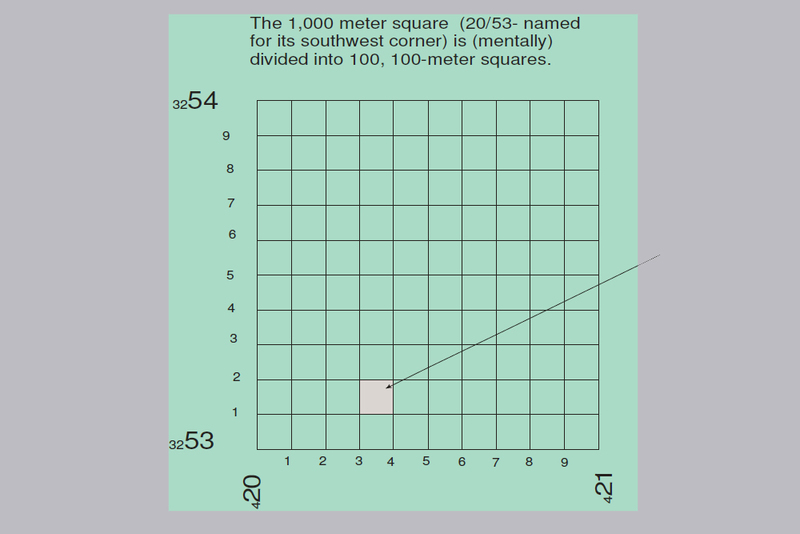 Each 1,000-meter square is divided into 100 100-meter squares. 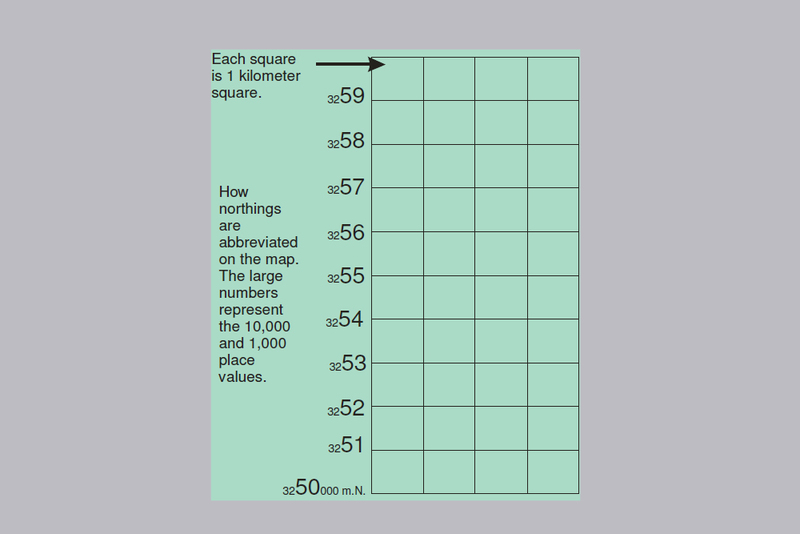 Each 100-meter square is divided into 100 10-meter squares. Finally, each 10-meter square is divided into 100 1-meter squares. A 1-meter square is as small as it gets in the UTM grid. 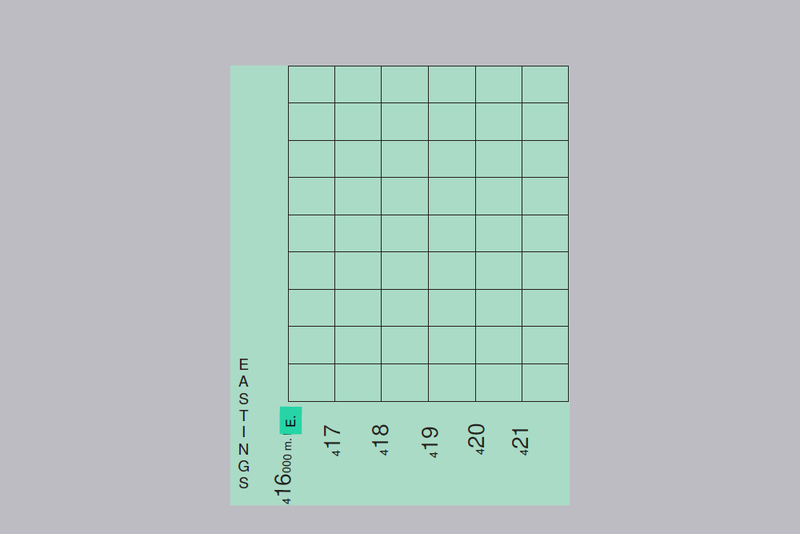 Grid coordinates are formed by the intersection of eastings and northings. Eastings are grid lines running north and south. The values assigned to eastings depend on their distance in meters--east or west--from the zone meridian. Northings are grid lines running east and west. The values assigned to northings depend on their distance--north or south--from the equator. The values assigned to eastings and northings are called false values because they are not based on anything universally scientific, but were selected for convenience sake to avoid having ever to use negative numbers or the directional notations of north, south, east, or west. When stating UTM coordinates, the easting is ALWAYS stated first, followed by the northing. 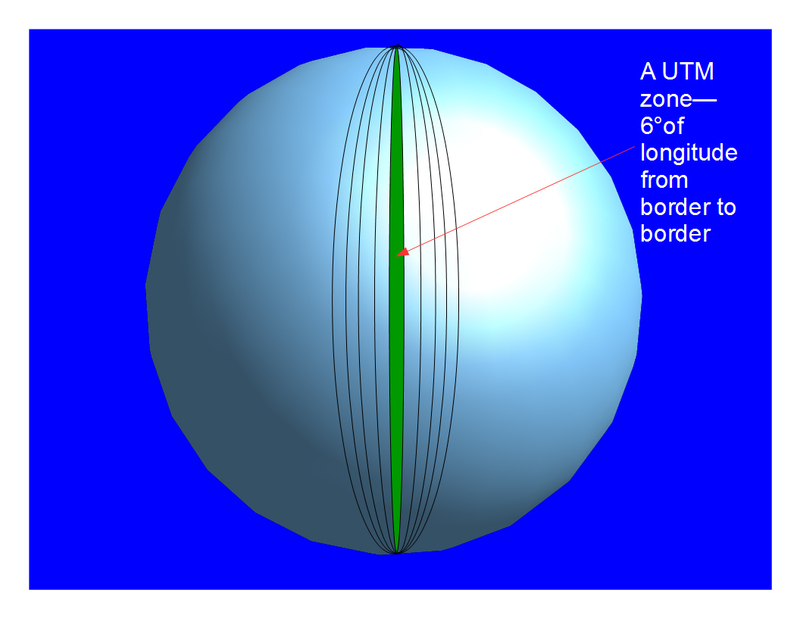 A UTM coordinate does not describe a specific point on the earth's surface, as does a lat/long coordinate, but instead describes the southwest corner of a specified square. The size of that square depends on the resolution of the coordinate. Coordinate resolutions can can vary from 100,000 meters square, down to a single square meter. The coordinate includes the zone number, the quadrant, then the numbers defining the square in question. Here, for example, is an example of a very high-resolution coordinate, describing a single square meter on the earth's surface. 17 R 479392 m. E. 2982319 m. N.
This single square meter is located in zone 17, quadrant R.
Since the grid that overlays each zone is 1,000,000 meters wide, the zone meridian is assigned a value of 500,000 meters east. East of what? East of nothing. Don't worry about it. Just say "meters east." Any easting value less than 500,000 meters east describes a location west of the zone meridian. Any easting value greater than 500,000 meters east describes an area east of the zone meridian. Notice that easting values ALWAYS increase as you go east. The easting of our UTM coordinate tells us that the southwest corner of our specified one-meter square is located 20,608 (500,000 minus 479,392) meters west of the zone meridian. 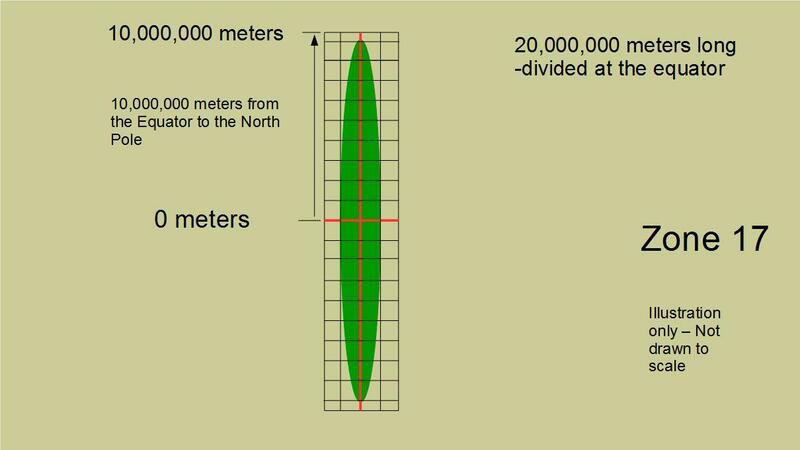 Northings describe how far a specified square is from the equator. In the northern hemisphere, the northing value tells you how many meters the southwest corner of a specified square is north of the equator. You'll recall that in the northern hemisphere, the equator has a value of 0 meters north. 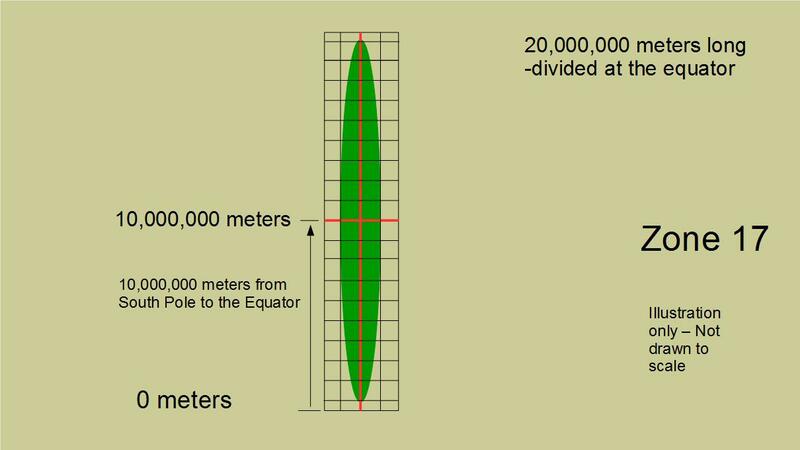 So, a northing value of, say, 1,000,000 meters North means that the southwest corner of a specified square is located 1,000,000 meters north of the equator. In the southern hemisphere, the northing value effectively tells you how many meters the southwest corner of a specified square is south of the equator. Recall that in the southern hemisphere, the equator is assigned a value of 10,000,000 meters north. (North of what? North of nothing. Don't worry about it.) So, for example, a northing of 9,000,000 meters north means that the southwest corner of a specified square is located 1,000,000 meters south of the equator. Notice that no matter which hemisphere you're in, northing values ALWAYS increase as you go north. So, the northing of our UTM coordinate above tells us that the southwest corner of our specified one-meter square is located 2,982,319 meters north of the equator. The southwest corner of our one-meter square, then, is located in Zone 17, Quadrant R, 20,608 meters west of the zone meridian, and 2,982319 meters north of the equator. That's pretty darned specific. Since eastings ALWAYS come first, there's no need to state which is easting and which is northing. What if we don't need to be so specific as to define a one-meter square? What if we want to define, say, a 10-meter square, a 100-meter square, a 1,000-meter square, or a 10,000-meter square? We can do that by further truncating the coordinate. Notice, I didn't round the 1 in the northing to a 2. The reason? UTM uses truncation, not rounding, when abbreviating coordinates. Many USGS topographical maps have the UTM grid drawn in. Some don't. They just have the UTM tic marks. When that's the case, you need to draw the grid yourself. 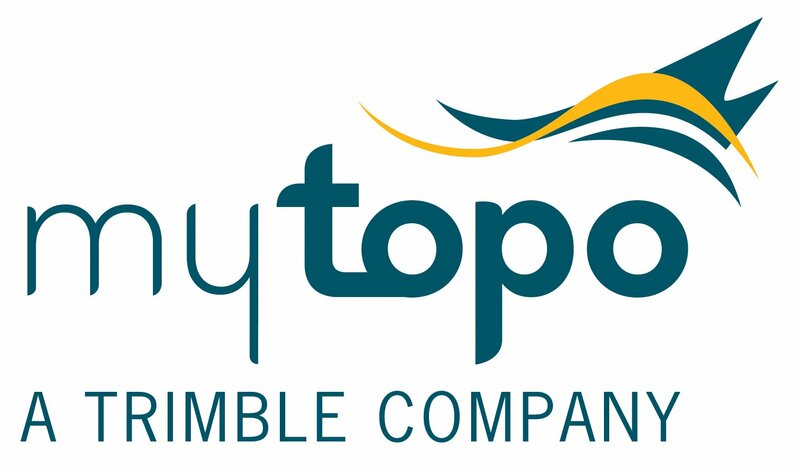 Below is a representation of a topo map, showing the eastings labeled. The westernmost easting in this case is 416,000 meters east. Many eastings are abbreviated, leaving off the last three numbers--those indicating units, tens, and hundreds--and including only the numbers indicating thousands, ten thousands, and hundred thousands. The thousand counters (17 thousand, 18 thousand, 19 thousand, and so on) are shown as big numbers to make them stand out. Northings work the same way. The full northing is usually stated somewhere on the map, but most northing values are abbreviated. Northing grid lines, like easting grid lines, span 1,000 meters on the map's scale. To find the coordinates of any given location, start at the bottom left of the map, and using the map's grid lines, search to the right until you find the closest easting line to the west of your target location. Next, go up that easting line until you come to the closest northing line to the south of your target location. The intersection of these two lines puts you at the southwest corner of the 1,000 meter square containing your target location. The coordinate of that location will be a 4-digit one, comprised of course of the abbreviated two-digit easting, then the abbreviated two-digit northing. The illustration below shows several examples. Now, let's say the coordinate you want to plot is 203/531. Since this is a 6-digit coordinate, it describes the southwest corner of a 100-meter square, as pictured in gray below. While the USGS topo maps don't divide 1,000-meter squares into 100-meter squares, as shown, there are special map tools you can overlay the square to do this. In the absence of such a tool, the trick is to "eybeball" the map, make a good guess where the 3 in the easting, and the 1 in the northing are located, then just plot that point. It's not pinpoint precision, but it's usually good enough. For a plotting accuracy greater than 100 meters, you'll need to use a special map tool for that purpose.